This album, a Columbia Special Products release, completes your J's with Jamie collection from Columbia records. Sent to radio stations as a promo for The Remarkable J's with Jamie, this mono release opens with "Commercials," a trip through the group's advertising work presented as a Dragnet-style narrative. It's just the thing to get your Black Friday consumer impulses stirred into a frenzy, and it includes Jamie's gorgeous version of the Mr. Clean theme. But wait, there's more! Stay tuned after the jump for a rundown of the Columbia releases and beyond. It's possible that there are other Columbia Special Products albums waiting to be discovered, but those would probably only add to the collection of available commercials, as most of their noncommercial tracks appear on more than one pressing. The group also had a life after Columbia, releasing two albums for ABC Records, Jamie & The J. Silvia Singers and Encore, which will be coming your way after the holidays. If you've enjoyed these posts, join me in a bit of thanks to Jim Maroney for the excellent rips, WFMU for the blog and bandwidth, and Jamie, Joe Silvia, Len Dresslar, and Don Shelton for these ever-enjoyable recordings. If you're a fan of product music and happen to be in the Boston area for the holidays, I'll be playing my Fourth Annual Tribute to American Consumerism on Thanksgiving night starting at 6PM. It airs on WMFO in Medford and features such favorites as "The Saturday Night Suit," "McDonald's Flexidisc," and "Dryclean When You Care," along with my custom mix of commercial bloopers. I gather you only link to the versions with the highest quality... Do the mono-versions do they differ anything the actual harmonics and the performance? The commercials are fantastic. What a pity they don't make commercials like the Js with Jaime's anymore. They're a pleasure to listen to. The narrative is hilarious. I'm really looking forward to hearing the Christmas songs. This particular album was only released in mono. 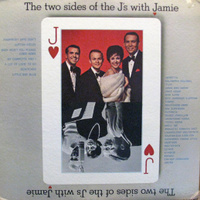 Some, like The Remarkable J's with Jamie, were released in mono and stereo. Having heard both versions of that album, I haven't noticed any difference between the two. There isn't any fancy stereo separation, and the vocals sound identical. Jim Maroney may argue that point with me, though. If this sales posting is to be believed, "Yoshiko"/"Everybody Says Don't" dates from 1964. Hope that helps.